-The London-based jewellery brand started in 2009 and has become known for its line of beguilingly beautiful products. -FINAL BOARDING from a fictitious airport. [#22] ''Folk（フォーク）'' takes part in ''MEMPHIS'' from 2013-14 A/W season. -Folk is a London based contemporary casualwear label. [#19] The Paraboot has been manufacturing in France, for almost 100 years. [#18] A hat is philosophy , attitude , style , soul , meaning of life for '' WACKOMARIA ''. -A HAT is their philosophy of the '' WACKOMARIA ''. 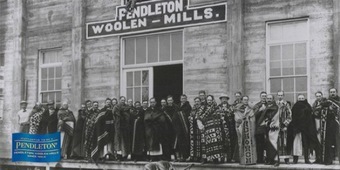 -PENDLETON WOOLEN MILLS since 1863.